Buy your Hycosan eye drops from Lenstore.co.uk for affordable prices and speedy delivery. 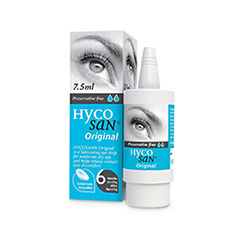 All of our Hycosan eye drops are designed for use with contact lenses and contain the moisturising ingredient Sodium Hyaluronate. They can be used for a full 6 months after opening. Sourcing all of our products from UK manufacturers, Lenstore.co.uk offers great customer service and the best quality products.